The 170-square-foot portable house achieves this look with stairs leading to French doors, a pitched roof and windows with blue trim. need, and the truth is, not much. The couple knew they wanted to downsize upon their return, and looked into alternative and affordable living options such as yurts and sailboats, but the tiny house seed had already begun to sprout. In the midst of traveling, they were already designing their tiny house on Google SketchUp, a 3-D modeling program. Together, they designed the layout, chose building materials, and had everything shipped to Colorado, where they planned to build when they returned. By the time they returned to the United States in June 2013, their materials had arrived and they were ready to begin building. After the house was complete, the couple towed the house-on-wheels to Portland with a truck they bought in Denver. 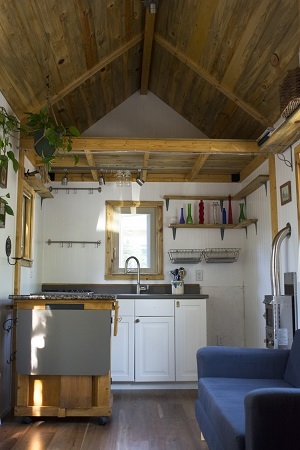 The tiny house provided them with low-cost and high-efficiency living. Built on a trailer, the house connects to a garden hose, and the composting toilet does not require water. A greywater system—which recycles water—forces them to conserve water. 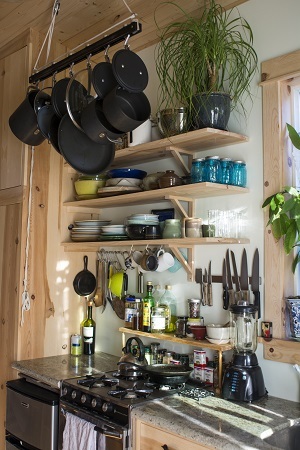 A collapsable table, hooks for hanging pots and pans, and a sleeping loft make the best use of the small space. 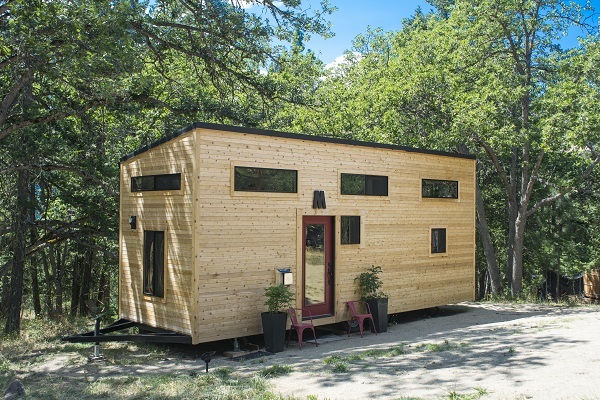 “Part of the tiny house movement right now is breaking out of that mold and saying, ‘This is a way to live, too, and it’s a great way to live,’” Anderson said. 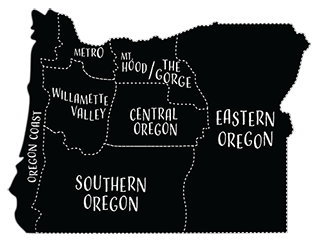 Living in a travel trailer, and frequently traveling back and forth from Portland to Canada, Nicole Mark didn’t want the burden of renting a room in a house. 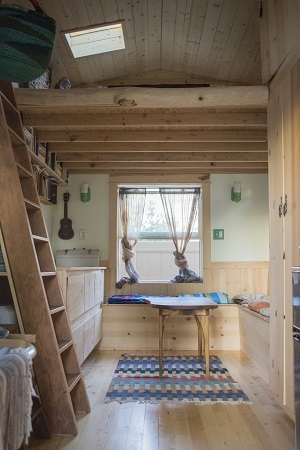 After photographing tiny houses on Cortes Island, British Columbia, Mark fell in love with the tiny homes and decided to build one of her own. “Most people my age can’t afford to buy a house,” said the 30-year-old photographer. 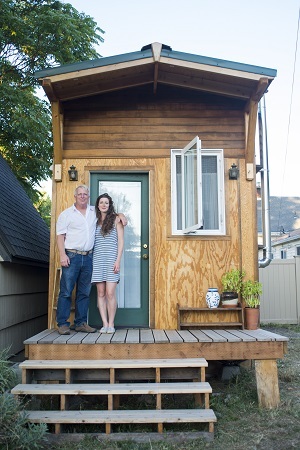 “I feel like the old American Dream isn’t really that attainable anymore, so we had to shift it.” Wanting to stay in Portland yet being financially limited, she decided to build a tiny house with the help of her dad, Reuel Mark, 52. 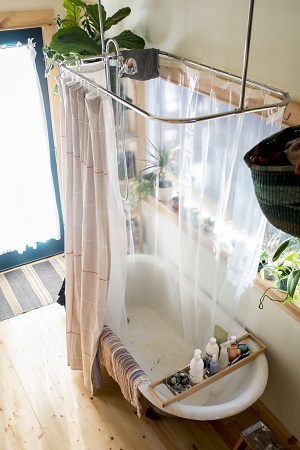 After taking a workshop in Portland on building alternative dwellings, she and her dad, a contractor with the necessary tools, completed the house in ten months. Working full time while building on the side was challenging for the two. They worked mostly on weekends, and sometimes three or four days a week. 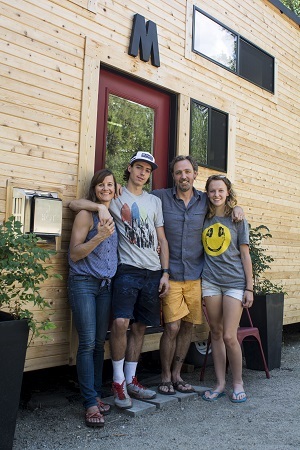 With the help of those in the tiny house community on social media, many people—some of whom were interested in building tiny houses themselves—volunteered their time to help build Mark’s house in exchange for the experience and the occasional meal from Mark. I feel like the old American Dream isnt really that attainable anymore, so we had to shift it. 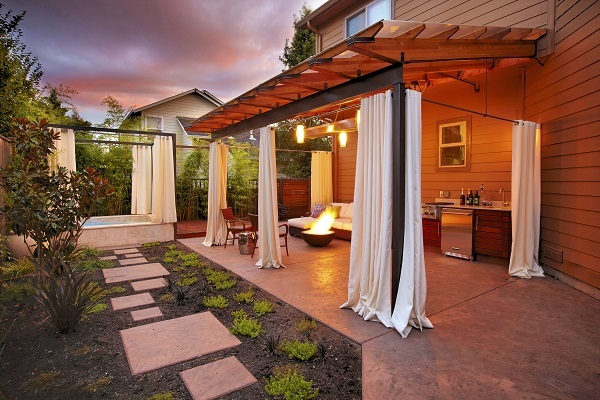 The 161-square-foot house is situated in the side yard of a friend’s Portland home. Mark pays rent for the land and pitches in for the electricity and water she uses. 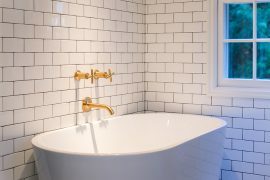 Mark and her dad designed the house to feel spacious by building high ceilings and details, including angled shelves under the ladder and storage benches, creating more efficient use of space. They built the pitch of the roof shallow so there would be more head room in the loft. Although her roof isn’t a classic style, Mark found it to be more functional. 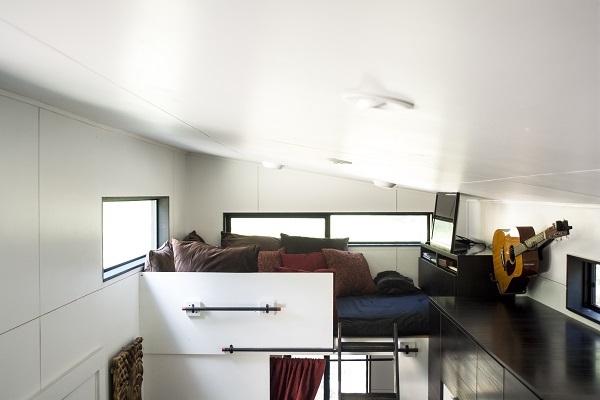 The loft, where she sleeps, adds an additional 64 square feet of space to the home. The windows and skylight draw light into the shabby-chic interior, creating the open feel Mark wanted. 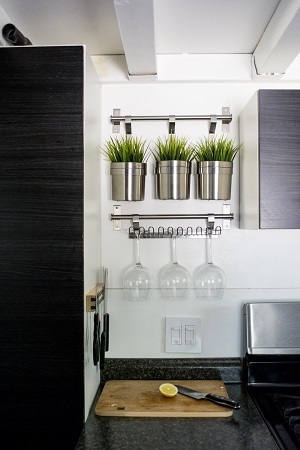 For Mark, it wasn’t just about living in a small space, but also about the decisions and lifestyle choices that come along with it. She is more aware of her impact on the environment, and strives for sustainable living. She also sold all of her furniture and gave away many of her possessions over the past year. “I feel that this is something people go through when they move into smaller spaces and it’s really freeing,” said Mark. 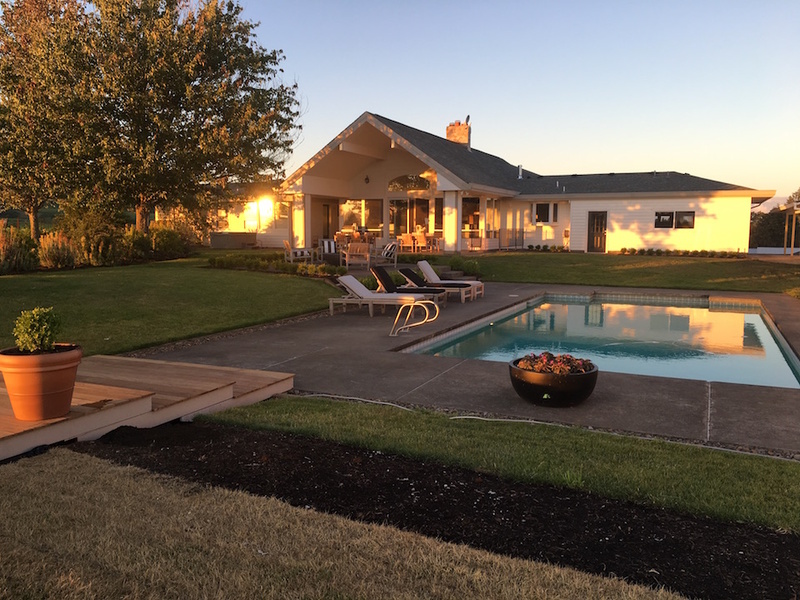 Down a windy, dirt road in the hills of Southern Oregon, the Morrisons’ 221-squarefoot house is nestled between the trees on their five-and-a-half acre plot of land. The contemporary house sits atop a hill, overlooking Ashland. Gabriella and Andrew Morrison live in the tiny house while their teenage kids, Terra and Paiute, have their own “lookouts” nearby. 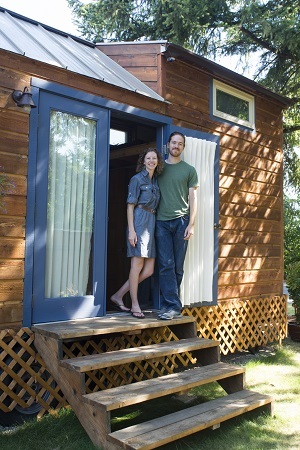 Self-employed in the tiny house business, and working from home, the couple provides resources and tools for people who want to build their own dream houses. Andrew travels the world teaching building workshops. Alternative living was never a foreign concept for the Morrisons. The well-traveled couple has lived off-grid before, once in an 80-square-foot log cabin in the Rocky Mountains with no electricity, no running water or heat. They’ve called a mansion on the seaside of Rio de Janeiro, Brazil home. On the other extreme, they lived in a pop-tent trailer in Baja, Mexico. 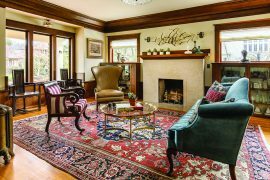 Searching for life right-size, the couple finally settled in a 2,200-square-foot “dream home” in Ashland. Soon they realized it wasn’t the dream they had in mind. “About six months after living there, we realized we had become slaves to the house,” said Gabriella, 44. “It was almost like we had bought the American Dream and had gotten ripped off.” They were sacrificing family time in order to work more to afford their house. The family dynamic suffered as they retreated to the different quarters of the home, losing touch with each other. It was almost like we had bought the American Dream and had gotten ripped off. In 2007, after hearing about the tiny house movement from a business contact, the family decided this was exactly what they needed. They shed 90 percent of their belongings, sold their house and bought a pop-tent trailer. While their son, Paiute, was in boarding school for ice hockey in Colorado, the couple and their daughter, Terra, moved to Baja, Mexico for five months to unplug and clarify their priorities. Before leaving for Mexico, however, the Morrisons piled mountains of belongings in their garage, separating necessity from excess. When they returned from Mexico, they realized many belongings they had labeled as vital no longer felt important. The couple agreed that the new house should have a full kitchen and a loft. The highest use of space was at a premium. Andrew, 41, has been a professional builder for nearly twenty years, teaching construction workshops for the past five or six. In four short months, their new home was complete. From the outside, the Morrison’s home appears small next to the average American home, but inside it is surprisingly spacious and open. 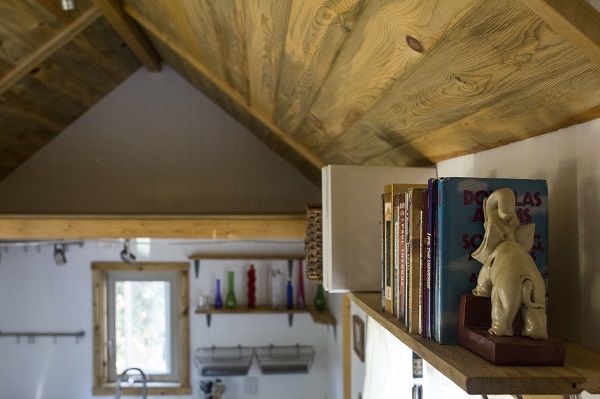 The angled shed roof allows for more open space and head room in the loft, making the highest point 11-and-a-half feet. The design makes smart use of space, with storage under the stairs, under its built-in benches against the walls and in the lofts. Tiny living is a liberating experience for the Morrisons. The family now spends more time together and outside on their land. They even have space to entertain guests, with outdoor seating and the tent trailer for overnighters. “There’s a sense of what we think we have to do, and it takes a while for people to break out of that … if they’re willing to break out of that,” said Andrew. Curious how much to build? What a great idea. Simple is better.